Is ‘Perfectionism’ Killing Your Business? Okay, so you want to make a video, but your team is feeling a little worn down after that twenty (or was it ninety?) hour labor earlier. Maybe tomorrow? So, today’s the day! You’re feeling great about your outfit, you somehow mastered an even cat eye, and your hair actually cooperated today! But wait…where did all that clutter come from? Why don’t you clear it off and try again later? Okay, so it’s later, but hold up. Is that clutter even worse? And who the heck spilled kombucha on these files?! Well, you know what they say! There’s no time like tomorrow. Sound familiar? It’s so easy to put off marketing for your business simply because you don’t feel ready. And that’s understandable. There’s a great chance your perfectionism has driven you to success. Maybe it helps you stay organized, keeps operations running smoothly, or unites your team by inspiring some shared eyerolls. 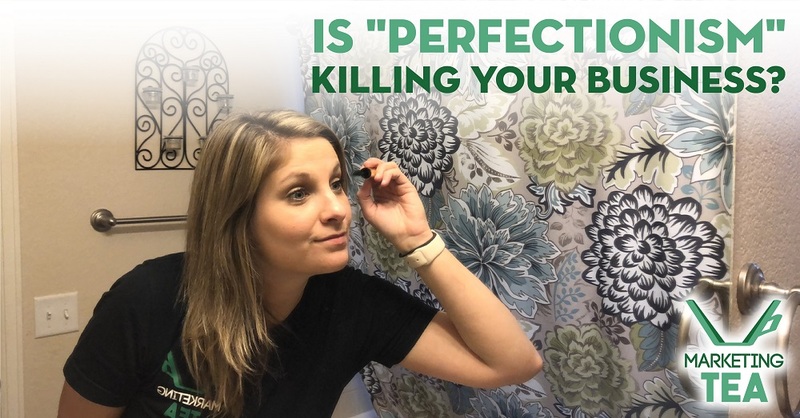 But when it comes to marketing, perfectionism can be a real killer. Here’s the issue. When it comes to getting your business’s name out there, the need to make everything perfect might stall things. A lot. You might not want to publish that blog post just yet because you want to do a few more edits (guilty!) Maybe you’re concerned with how your hair or makeup looks and would prefer not to make a video until it’s looking better. Perhaps you’re feeling stiff and are worried about making your audience feel more bored than a kid at the opera. These are concerns that might feel HUGE to you. After all, it’s only human to feel self-conscious! But in today’s digital age, you can bet your competition is not going to wait. And if you’re slow to churn out content, it’s going to make it much harder for your audience to find you. Trust us. You might be worried, but your audience is not going to notice those teeny tiny imperfections. They’re not going to dissect your writing and wonder whether you should have used a different synonym in that blog post (at least, we hope not), and they’re not going notice if your eyeliner is a tad bit uneven. What they will notice is if you are genuine. If you truly care about your business and about empowering your clients, your audience is going to take note and seek you out. So, rather than worrying about making the best video that goes viral, just make sure you’re being true to yourself and honest with your audience. Authenticity trumps perfection every time. Sit back, take a deep breath, and press record. We promise you, you’ll be happy you did. Need some more motivation or some help getting your authentic content looking much closer to perfection? That’s where we come in. Have a chat with us, and we can help you get there.